CBL200 consists of a 2 mm female socket leading to a 1.5 mm female Touchproof socket. This 10 cm extension is required when converting an old-style 2mm pin electrode or transducer lead to a 1.5 mm Touchproof socket for connection to any of the 100C-series Biopotential or Transducer amplifiers or STMISO series modules. One CBL200 is required for each old-style 2mm pin. Connect a female socket 1.5 mm Touchproof electrode lead to the DA100C amplifier. Connect a ground electrode lead (e.g. LEAD110A) to the UIM100C module—required when using the TSD150 active electrodes. Convert a Touchproof 1.5 mm female socket electrode or transducer lead to an old-style 2 mm pin, for connection to any of the 100B-series Biopotential or Transducer amplifier modules. One CBL201 is required for each Touchproof socket. 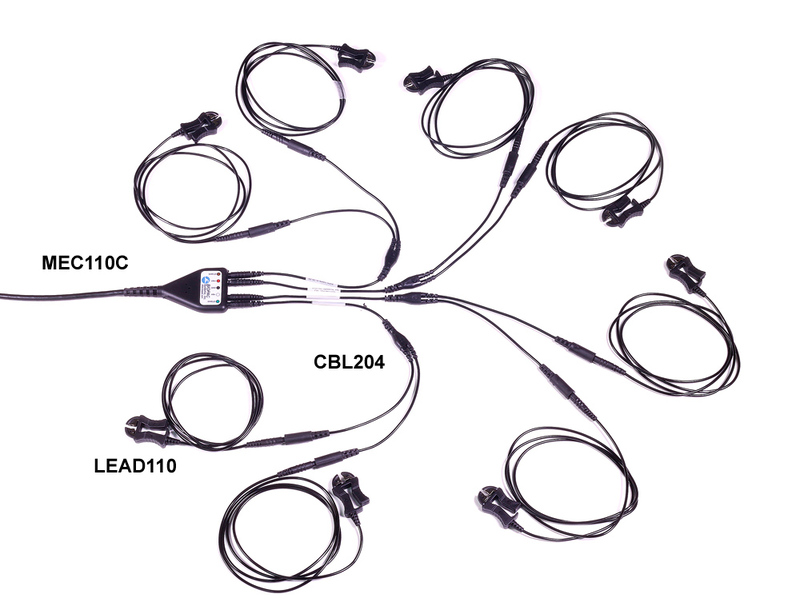 For MP36/35/45 Systems CBL201 is used to update older model SS1L Shielded Lead Adapters. Connect a 6.3 mm male mono phone cable to the digital I/O lines on the UIM100C. Connect microphones or signal sources that terminate in a 6.3 mm male mono phone plug to the DA100C. 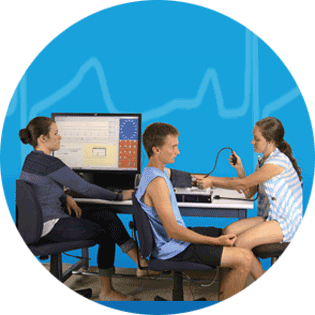 Connect the STM100C to nerve conduction chambers (CBL105 required). CBL203 consists of a female mono 6.3 mm (¼”) phone socket leading to two female 1.5 mm Touchproof sockets and is 10 cm long. 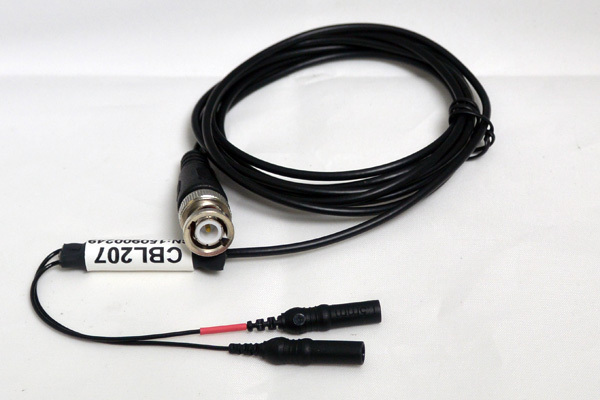 CBL203 is primarily designed to connect YSI 400 series biomedical temperature probes to the SKT100C temperature amplifier, but it can also be used to connect certain male mono 6.3 mm (¼”) phone plug terminated cables or transducers to 100C-series Biopotential or Transducer amplifiers. Connect to SKT100C Vin+ and Vin– ports (either socket to either port); thermistors do not make electrical contact so GND is not required for safety. If using a 3rd-party probe with metal casing, the ground lead from the probe can be connected to SKT100C GND. CBL204 consists of a single female 1.5 mm Touchproof socket leading to two male 1.5 mm Touchproof pins and is 25 cm long. 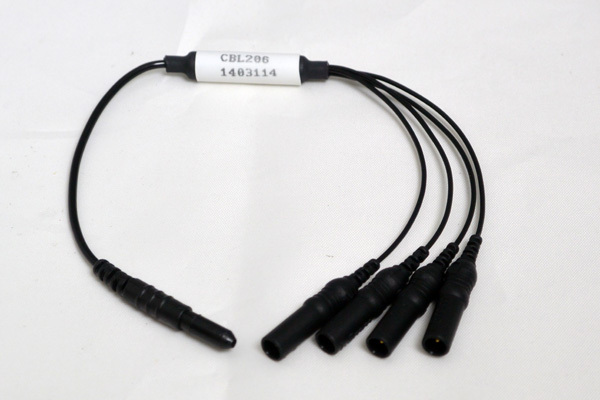 The CBL204 plugs into any 100C series Biopotential amplifier input or STMISO series stimulator output and provides two sockets to connect to electrode leads terminating in a Touchproof “Y” electrode lead adapter. This Touchproof “Y” electrode lead adapter is required when multiple electrode sites are to be connected to a single amplifier input or stimulator output. Multiple CBL204s can be plugged together to reference three or more electrode leads to the same input or output. For MR applications, see the CBL228. 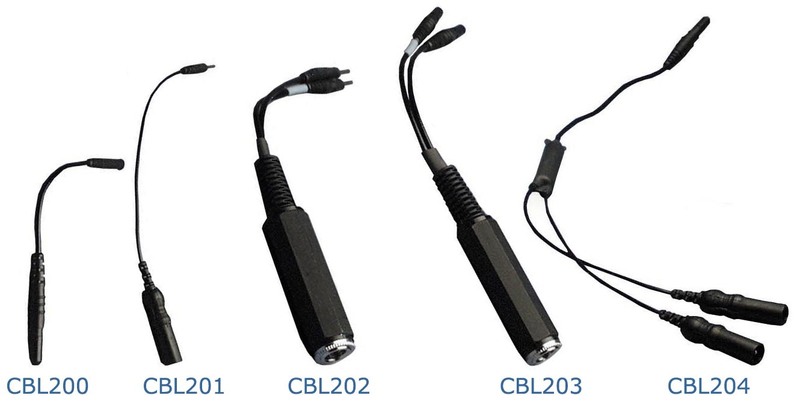 CBL205 is a Touchproof male to female 1.5 mm AC-coupled electrode lead adapter and is 10 cm long. One end of the adapter plugs into the ground on the biopotential amplifier and the other end accepts the electrode lead. 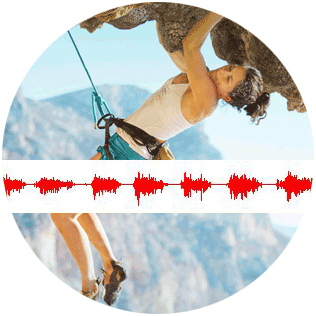 Use CBL205 when more than one ground is required while recording electrodermal activity (a.k.a. 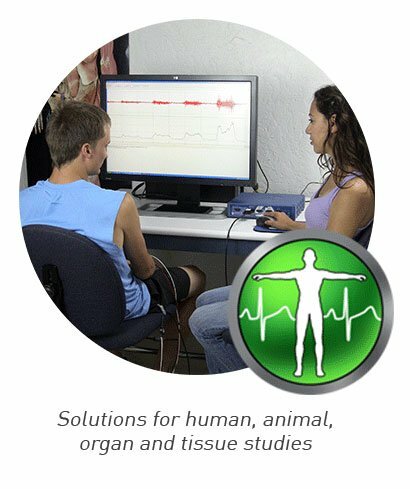 galvanic skin response). 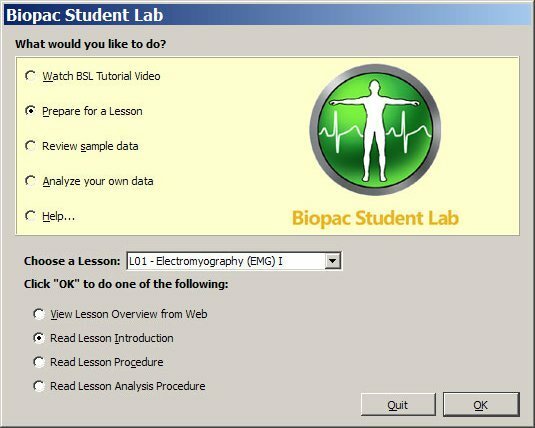 To record EDA with other biopotential signals (ECG, EEG, EOG, EGG, EMG, ERS), BIOPAC recommends using CBL205 connected to one ground on any of the biopotential amplifiers. The subject will be grounded through the Vin- of the EDA electrodes, but in some cases it is necessary to have more than one ground; in such cases, use an AC-coupled lead adapter (CBL205) to prevent galvanic ground loops. 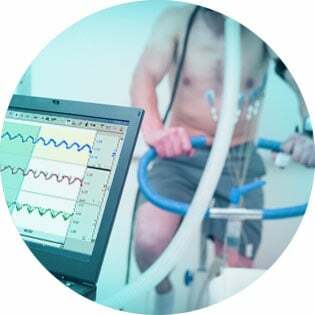 For example, if—while recording a biopotential and EDA—the EDA electrode is removed during a stage of the experiment, you will want to maintain ground for the biopotential. To always have a ground and no ground loops: connect the Vin- lead of the EDA as ground and connect an ACcoupled ground to the biopotential amplifier GND. Safety Note—If using any two EDA100C, EBI100C or NICO100C modules at the same time on the same MP System, ground loops can be a problem due to non-isolation between module excitation currents. A possible solution is to record with one module connected to a separate IPS100C and HLT100C, and the remaining module to the MP System. Use OUTISO signal isolators to connect the first module outputs (via HLT100C) to the UIM100C on the MP System side. Lead junction TPF to 4X TPM. Reference four electrodes from one. 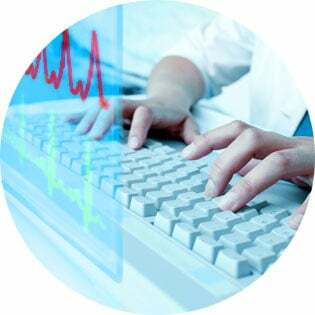 Connect via the MEC110C to the NICO100C and EBI100C cardiac output amplifier modules. Allows a ground lead (such as LEAD110 or LEAD110A) to be connected to the subject if active electrodes TSD150A or TSD150B are being used when no other wired ground is present. 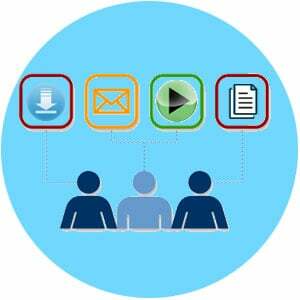 Safety Note—This adapter is required if only active electrodes are being used and no other wired signals are being recorded; if there is another C-series biopotential amplifier that has a ground connection to the subject, this adapter is not required.